October really has been quite a special month for the Society, and on Sunday it culminated in an assault on one of the great Shropshire landmarks, The Long Mynd. It’s been on my list of un-ticked rides for too long, so with a favourable weather forecast and an empty Sunday morning, its time had come. For a variety of reasons this was to be a solo ride, and after a late scare due to a misbehaving Garmin Edge, I was rolling. The route’s outward leg saw me drop down into the Gorge and then head through Cressage via Buildwas and Leighton. It was on the run from Cressage to Church Stretton that the nagging headwind became most apparent. Riding solo meant that there was no hiding place, and it certainly hampered progress. Crossing the A49 meant that the real climbing would soon be starting. 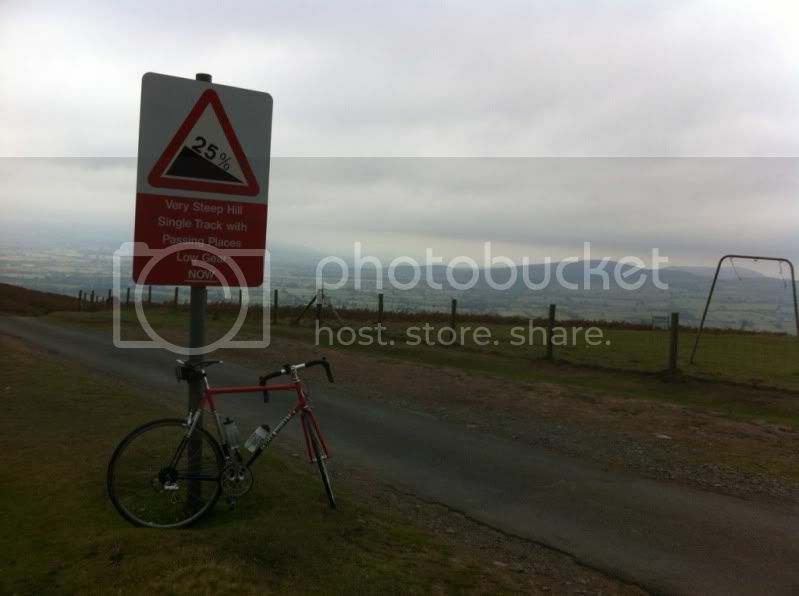 Rolling through Church Stretton, there was little to warn of what lay ahead. A right turn and I was onto The Burway, a climb which scores 9/10 in Simon Warren’s(@100climbs) excellent book 100 Greatest Cycling Climbs. After a gentle(ish) start the tarmac kicks up hard, and as I passed a 20% sign I was glad of the 29 that lurks on my rear cassette. It’s not used that often, but I was glad to have it now! I’ve ridden a few big climbs over the years, and for sheer steepness this is right up there. I felt like Froome and Wiggins must have done, be it at a much slower speed, on the Angliru at this year’s Vuelta as I struggled to turn the gear. At a couple of points I even adopted the ‘zigzag’ method as I tried to overcome the unrelenting gradient. 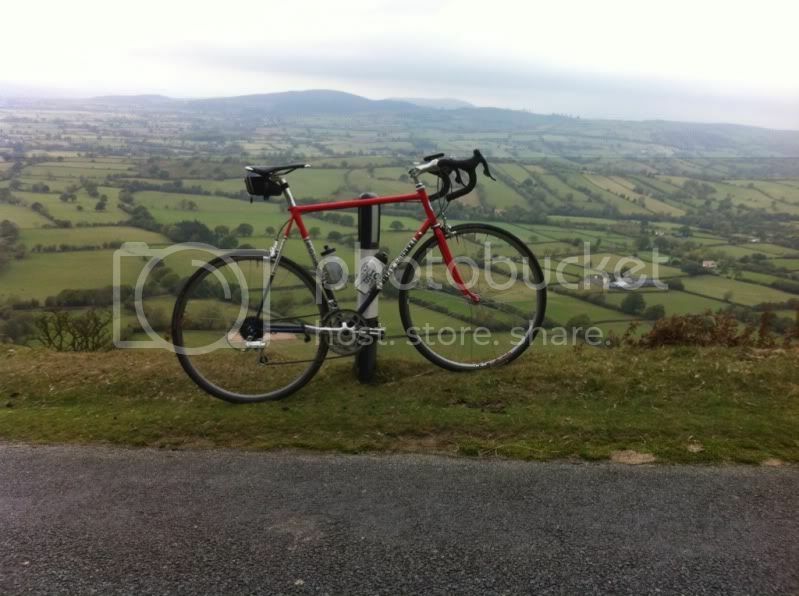 The gradient finally began to ease as the road climbed up onto the plateau of the Mynd. The reward for all the climbing being stunning views in every direction. The road continued to undulate as it made it’s way across to the gliding club that sits on top of the hill, and on my way I took a moment to tick another box. From here it was time for the descent. The warning sign at the top doesn’t really prepare you for what was to follow. A quite ludicrously steep piece of tarmac! Tight, and with a number of blind bends, this is not for the feint hearted, the drop off the side of the road is pretty well sheer. Once safely down, it was time to head for home. My plan was to return by a more southerly route, passing through the wonderfully named Ticklerton, before riding back along Wenlock Edge to Much Wenlock. Back on more regular riding territory now, the climbing was beginning to take its toll, and the climb up to Broseley was a struggle. Sutton Bank followed, and I don’t think I’ve ridden as slowly up there for some time. The last 5km or so were a flat out blast back into Shifnal and as I came over the top of the Wyke the 100km for the day was completed. Route details below courtesy of the quite excellent Garmin Connect. A very enjoyable outing all round. Solo riding on hilly routes..cannot decide myself whether this is masochistic or character building. Only thing missing from your report was the Tea Stops..but then perhaps you young uns ( I am an OAP who has only recently bought a bike ) dont need these refuelling stops. Excellent report.